Adventure Scuba is a PADI 5 Star Dive Center and offers PADI Scuba Courses for the beginner diver or snorkeler all the way through Advanced Open Water Diver, Rescue Diver, Divemaster and Assistant Instructor. 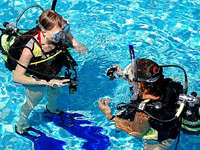 Our professional staff is there to help advance your scuba skills and have fun in the process. We offer the PADI Scuba courses through out the year. You can join a scheduled class or set up a custom class just for you! Discover Scuba Diving Every great adventure starts with a first step. Our Discover Scuba program let’s you take a dip into diving before your dive in. Open Water Diver You are ready to join the scuba crowd and learn to dive. This is the course for you. Advanced Open Water Diver As an Open Water diver you learned the basics of diving- the PADI Advanced Open Water Course fine tunes those skills and introduces you to a variety of types of dives. Rescue Diver Learn to prevent and manage problems in the water and become more confident in your skills as a diver. Master Scuba Diver The Master Scuba Diver rating places you in an elite group of respected divers who have earned this rating through both significant experience and scuba training. Fewer than 2% of divers ever achieve this. ReActivate Are you a PADI Diver and its been awhile since your last dive? Time to re-activate your skills? The PADI ReActivate course is the course for you. You will update your skills and diving knowledge to make sure your next dive is as enjoyable as your last one! As a bonus, this course includes an updated C-card! Scuba Tune-up Not a PADI Diver, no worries- we have a tune up course for you too! PADI Divemaster and Assistance Instructor You’ve been having a great time diving, but are now ready to share your love of diving? The PADI Divemaster and Assistance Instructor courses are for you! Emergency First Response– Emergencies happened at home, at work and at play. The Emergency First Responder course is OSHA approved and is a comprehensive first aid course for divers and non-divers alike! PADI Bubble Maker and Seal Team specially designed courses for the little guppy crowd!